This book is about letting the little guy do what the big guy has always done. Hedge funds, pension funds, and other institutions have always used relative strength investing to rack up big returns, yet the methodology has never been presented to the individual investor as a viable, easy-to-understand investment strategy, as it is in this book. Michael Carr, a personal investor with a longtime background in system design and analysis, has applied his professional expertise to investing. 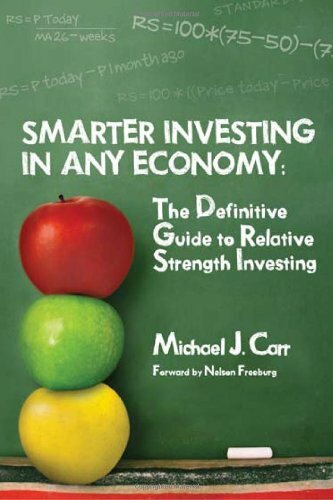 After running millions of relative strength calculations, Carr proves that relative strength investing works in any market climate. By strictly following his methodologies outlined in this book, you can more than double the returns of the S&P 500, with less risk. Carr shares his results, methodology, and step-by-step instructions here in this book. Smarter Investing in Any Economy: The Definitive Guide to Relative Strength Investing will show you how relative strength strategies allow you to invest successfully in both bull and bear markets. Even in a market downturn, something is always going up. Relative strength will help you pinpoint that stock, currency, or commodity that s on its way up. Recent advances in computing capability and the widespread availability of ETFs have now opened up relative strength strategies to virtually any investor. Relative strength has been widely used for years by financial institutions; however, it was never accessible to individual investors because of complex custom programming requirements. Computing advances, coupled with new ETFs that limit risk have made relative strength a viable strategy for long-term investors and day traders alike. Carr has broken down his technique to the level that any Microsoft user can implement his strategies successfully. If you have any questions about this product by W&A Publishing, contact us by completing and submitting the form below. If you are looking for a specif part number, please include it with your message.